Thank you to all of our volunteers and supporters who helped us make miracles for so many years. Quiltworks and Thriftstitch are closed and no longer exist on Bayshore Blvd. But our mission continues in spirit with our incredible volunteers expanding their time and skills supporting a variety of wonderful agencies serving our Bay Area neighbors. She also has a Bed & Breakfast just two blocks from her Shop. If you ever have a chance come visit the shop and the bed and breakfast in Mazatlan. It is a great place to visit for retreats or just with your favorite quilting friends. Check it out on the website for more info. www.sfquiltshopinmazatlan.com. March 29 & 30, 2019 will be first Mazatlan International Quilt Festival. This festival will feature 300 quilts, vendors, classes and demonstrations of quilt making. The first of this type in Mexico. We hope you will check out our Facebook page and website and consider entering a quilt or even attending. We hope to attract quilt enthusiasts from all over Mexico, Canada and the US. It can change your life forever!!!!! We all know a marriage certificate or a death certificate can have that level of power, BUT how could we be prepared for a simple letter from the bank you have had your non-profit account with since January of 2011, shut down everything!!! Bank of America selects accounts for updating information at random. They sent us a letter we never received stating they want us to update our information. We did not respond. They sent us a letter on Oct. 30, the day I left for Mexico stating that if we do not respond in 21 days, they will close our account. Jay thinking it was my personal banking, did not open this letter. That we are guilty of. In any case, I go online to manage our business as I do and "ACCOUNT CLOSED". I tried everything I could to enter the account and see what was going on and then the bank froze all of the accounts because someone was attempting to breach our account from out of the country. That was ME! So I needed to come home and straighten this out. All of our Visa charges and square charges n November went into cyber space. All of our payments for the phones, electricity, alarm are on auto pay. Yes, that is why the phones are shut off , not because we did not have money to pay them. Our account was closed, funds removed. DAMN. It is a mess. I arrived on Sunday, Dec. 10, late and on Monday morning went by store got the checkbook and went to the BofA where I opened the account. I needed answers and help. After hours they told me they could not help me unless I gave them the control number in the letter. So I went through all the mail and did find the letter dated Oct. 30 that warns if it is not answered in 21 days, the account is closed. Now we had $2336.38 in the account, checks written and cashed and deposits so we clearly were active. Since the day we opened the account we have NEVER been overdrawn or bounced a check, so we are good customers. That just doesn't count. The bank sent out a check for the $2336.38 to San Francisco Sewing and Quilting Collaborative, Inc. Our original name. As you all know we shortened that to QuiltWorks with a DBA (doing business as) because no one could remember the original name and it was toooooooo long. She said she was sorry but we were one day to late to reopen our account. WHAT??? I was here two days ago. After two more hours, the bank manager and TEARS….they said come back tomorrow with all of your Articles of Incorporation and Fictitious Name Statements information and we will open a new account. I spent hours looking for all of that information that originally was in my home office, which is GONE. Where is it exactly? I don't know. Can be in Mexico in a box I have not unpacked yet, or in storage or a box somewhere in the garage. Don't know. Jay and I spent hours and we tried to find that original information but could not. I will have to go to the Secretary of State's office in Sacramento and get a copy of the Articles with the official SEAL from California and then I can get copies of Ficticious Name Statements from the City. I did not have the time required on this trip so I must return the first week in January and handle this. In the meantime they finally allowed me to open a simple checking account for SFSQC,INC because they agreed they must have reviewed our information at the original opening date and we have been a solid account for 7 years. Thursday at 4:30, after two more hours, we opened a new account with the check BofA sent us with our money to put into the new account. BUT, she said they may have to put a hold on the funds………. I had no words. I am so done. I just wanted to let you all know how just one missing letter can shut us down. We held a Board meeting to discuss the situation. We also have had very little sales in the last few months. So we would likely have come to this decision about ThriftStitch but wuld have appreciated not having our phones shut off and all other accounts. The Board voted and we all agree….we will close THRIFTSTITCH but QuiltWorks and it's mission will continue. Bank of America can close our account, but they cannot close our mission and good work!!!!!! We are currently working out the details but we will leave three long arm machines in San Francisco location and we are negotiating with SIPS N SEWS to strengthen our relationship and use their address as our "brick and mortar" location. We will continue to provide kits, have two drop off and pick up locations and provide to the many organizations we have supported all these years. We will maintain all of our wholesale accounts to be able to provide batting and cotton to the many non-profit agencies we currently support. There will be no major sale, all of our supplies will be used to support our programs and other non-profit agencies, as we always have!!!!!!! But ThriftStitch will close in January. Thurs., Dec. 21 and Fri., Dec. 22 and Sat., Dec. 23. Our Hours 12 - 5 Can't call us so just come, we are there. If you have any tops, pillowcases, stockings, etc. Please drop off at ThriftStitch on the dates above. We will have new information on pick up and drop off locations starting January 2018. St. Anthonly Stitchers and their groups. We will make up kits for pillowcases for Family House, they give away 200 a month. We are their only source at this time for pillowcases and quilts. QuiltWorks will still need all of your wonderful volunteer efforts and many people in need depend on YOU and US! I will return in January and we will have a lovely good bye party. Hold the date…..
Have a wonderful Holiday Season all of you. Cinderella, her new sister Isabella, (another rescue) and I will be in sunny Mexico with friends. It has been an honor to work with all of you. 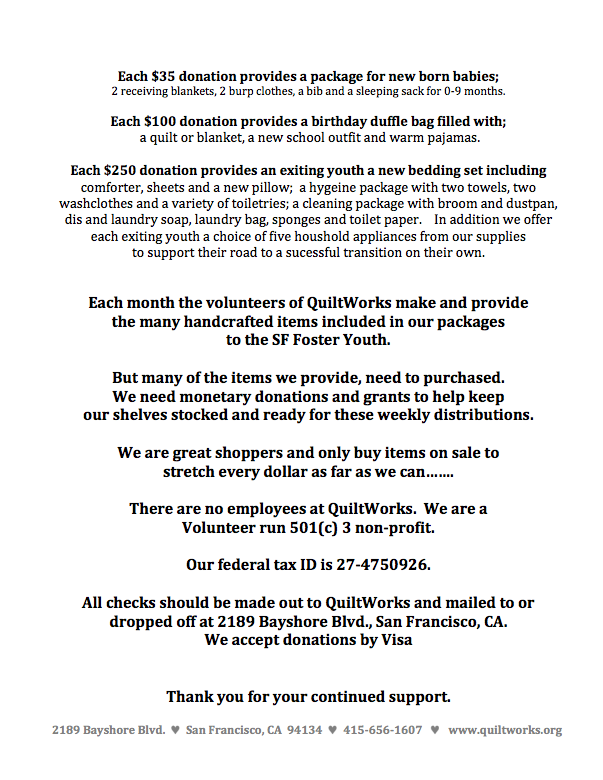 When we established San Francisco Sewing & Quilting Collaborative, Inc. in January 2011, we also established a boutique to sell donated items as a funding source to raise money to bring our programs to SF bay area Community. In 2012, we converted the boutique into a fabric store. With the closing of three California quilt stores in a two week period, (Napa, Hollister and Brentwood), Linda purchased hundreds of bolts of fabric quality quilting fabric. Since our programs require thousands of yards of cotton each year, we always sought ways to stretch our dollars. Presto - The boutique area was converted to a fabric store. At this time, we re-branded our name, from one that no one could remember, to ThriftStitch – our fabric store and QuiltWorks – our quilting studio. The funds raised at ThriftStitch and QuiltWorks were solely to provide funds for our programs. We were established as a volunteer run non-profit and to help raise funds necessary to demonstrate public support. Over the years we worked with several programs to have interns working in our store to help establish consistent hours and sales. This proved not to be a fit for us. ThriftStitch has also enabled us to establish wholesale relationships with major fabric brands. We are able to purchase at wholesale, stretching our dollars. As a store, we pay sales taxes, as every store does on our sales. All fees earned by quilting were considered donations to the non-profit as well. At the same time, we are able to provide wholesale priced fabric to other non-profits and schools, such as Women’s Resource Center, Quilts of Valor, and an additional variety of schools and non-profits through out the bay area seeking donations of fabric, quilts or pillowcases as requested. We provide fabric regularly to many groups we collaborate with such as the St. Anthony Stitchers, Homeless Prenatal Program, Pacifica Quilt Guild, Ryan’s Smiles, and others. What is the role of ThriftStitch today? ThriftStitch Fabric Sales are fundraisers for QuiltWorks Collaborative. When you purchase fabric at ThriftStitch, you are helping support our programs, provide fabric and items to those in need in our community. You are shopping with a purpose. ThriftStitch is a location we “drop-off” of finished items and a location for “pick-up” of kits to make those items we provide to our community. Our goal is to hold a three-day fundraiser fabric sale each 4 – 6 weeks. They will be held on Thursday, Friday and Saturday, hopefully to include everyone’s schedules to come and shop. For many San Franciscans with limited area to do their volunteer work, it has also provided a space to gather with other volunteers and make items for our community. ThriftStitch, located at 2189 Bayshore Blvd., #102, San Francsico, CA 94134 is our corporate headquarters office. We receive our mail at this address, and maintain our telephone and answering service at this address. This is our official office. shopping, picking up and dropping off each week. Our hours will be 12 – 5.
our assistant treasurer, Jay Sagan. This week I plan on calling each of our major key volunteers to discuss how we can support you, supporting us. Looking forward to talking with several of you.